Ok. I’d planned to wait to announce. But I can’t wait any longer. Patience has never been one of my virtues — ask anyone who knows me. I wanted to get the new website up and running and do the announcement there… but the excitement has taken over! I now have my dream machine! A “new to me” 1974 25-foot Airstream! And she’s sooooo pretty! Hitting the road is not going to happen immediately. I have a 16-year-old son that needs to graduate high school here in Russell Springs, Kentucky and head off to college. I have some new technology to test (much of which probably hasn’t been designed yet). I have two years to get everything perfected. But it’s distracting how much I think about working in my mobility and my love of “living small” into one huge project like this! My husband, who was formerly less than thrilled with the whole “going mobile for an extended period of time” idea… is getting the fever. *Angela rubs together hands conspiratorially and cackles in delight* Once he went into Serenity… he started talking with me about what we need to do to get her packed up and ready. He’s been bitten by the bug! We both know that it’s going to be challenging. Long-term travel plans with three occupants, may be a bit stressful. But, I can’t wait!!! You know, I’m MAKING myself stay out of the little space pod until I can catch up on all my current client work and get the new site launched. It’s a real incentive program I’ve got here! I’m getting alot accomplished and am working when I’d planned on taking some time off this week. But, I have so much to do! I’ll be sharing the experience on a new website I’m designing, but I won’t be announcing that site until I have it ready to launch. So, stay tuned and you can follow along as I prepare my life to be REALLY mobile with a customized Airstream “mobile office” to quench (or exacerbate) my thirst for adventure. Now, if anyone would like to help me shorten my research time, and give me their feedback about working on a portable satellite dish ISP, I’d appreciate the info. I’ve used a standard satellite on the farm, but I’ve not worked with the portable variety. I’m planning to set up a wireless network with a rack of 500+ external hard drives to hold all my information (including music, movies, ebooks and homeschooling materials for Alex — in addition to the work stuff). Geeze, my mother really comes out in me when I start planning big projects like this. My husband calls it “when you get so excited and focused that you are giddy about a new toy/project” — he just grins at me, gives me a hug and stays the heck outta my way. LOL. Wise man. He’s planning to help me get her ready. I’ll be depending on him to learn and maintain all the electrical systems on Serenity. I’ll do the computer and tech additions (hardware and software) of course… and with the two-year window, I’m seriously considering looking into a solar option for being able to be in beautiful places around the US — that are off-grid — without losing my ability to work online. So much to plan, so much to learn, so much fun and excitement to be had! Of course at this particular moment, we don’t even own a vehicle that will pull our new little girl. With my concerns about the current economy (I’ll be writing about this more later), we are working on finishing off paying any outstanding debt before we buy a truck. One Response to "My "New to Me" Latest Toy is a Classic Airstream — Destined to Become… A High-Tech Mobile Office!!!" I am a photographer who is thinking of getting an airstream to use as a studio. Unlike you, I “don’t” (yet anyway) have plans to pull it. I want to dock it in the back yard as an “extra” space to do my thing. What can you tell me about your dear Serenity. All I know is that, when I find her, her name will be Estella Faye. That was my grandmother’s name. 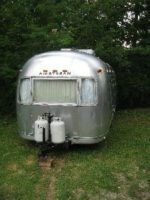 When you can share some Airstream insight, please drop a line!